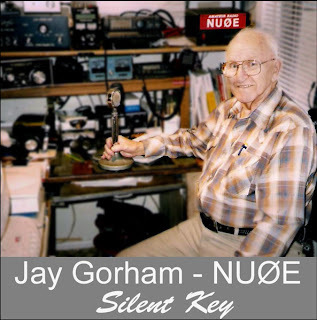 In the world of amateur radio so loved by our friend Jay Gorham, a “Silent Key” is the term used to recognize those ham operators who have passed away. It hearkens back to a day when telegrapher keys were on the cutting edge of technology, almost magically filling telegraph lines and the ether with Morse Code -- a mode still used by many hamy operators. Jay Ellis Gorham of Spearfish joined the ranks of Silent Keys on Thursday, February 12, 2009. He was 91 years old. 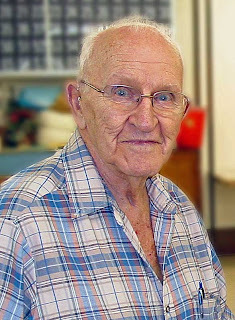 Born in Dunlap, Iowa, Jay’s family moved to Spearfish in 1922, when he was four years old. Except for a few years in Washington state and Navy service during World War II, Jay called Spearfish home. Here’s a full obituary for Jay as it appeared in the Black Hills Pioneer, recounting some of his many accomplishments and affiliations. A standout football player at Black Hills Normal School in the 1930s, Jay was later a radar operator in the Navy, returning to Spearfish after the war to begin a 30-year career as a partner and then owner of Gorham Brothers Welding and Machine Shop. As seems to be the case with so many good people, Jay’s diverse interests were transcended by his love and affection for his wife, children, and grandchildren. He enjoyed following his children’s activities, and found joy himself in activities randing from gardening and bowling to hunting and golf. He loved history and was a frequent attendee at meetings of the Spearfish Area Historical Society. Jay was heavily involved in the community – everything from being a long-time volunteer fireman to membership in the American Legion and St. Joseph’s Catholic Church. We knew Jay only for the past few years through our shared interest in amateur radio. He was one of the first people I met when retiring to Spearfish in 2005, and he quickly became one of my favorites. Thanks to fellow ham Bob Weaver for sharing the picture at right of Jay in his "ham shack." Last year, when I decided to erect an antenna mast, Jay volunteered some pipe and tools to help me accomplish the job – in addition to offering some sage advice on how to best accomplish the task. As I mount a new HF antenna on the mast this spring, I’ll be saying a special “thank you” to Jay Gorham. To Jay’s wife, Agnes, and their entire family, we extend our deep condolences. He is gone but will not be forgotten by the many people whose lives he touched in a most wonderful way. 73 to our good friend Jay.